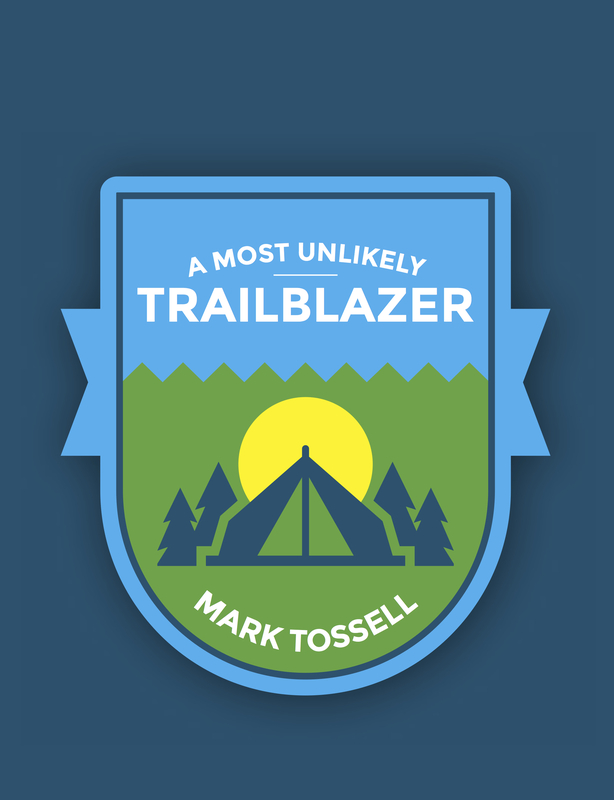 You’re using Salesforce, the #1 CRM in the world. It comes with great native analytics, providing powerful, customisable reports and dashboards. It’s working really well for your team or business. 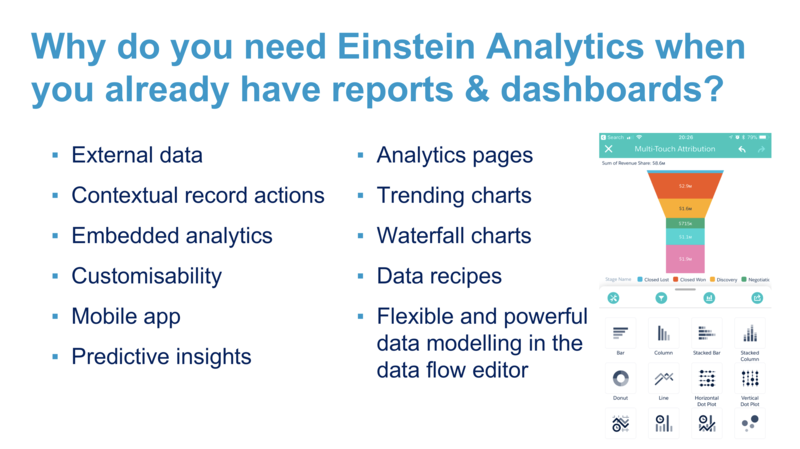 Why, then, do you need Einstein Analytics when you already have Salesforce reports and dashboards? If you would to go to the effort and expense of adopting Einstein Analytics, you need a “Why?” You must understand the differences between Einstein Analytics and your native analytics, and you need to identify your business use case/s, in order to justify the change. I know – I helped guide a wealth management business through this process after we had implemented Financial Services Cloud and built some very effective reports and dashboards. It wasn’t easy – but the end result was revolutionary. Why do you need Einstein Analytics? First, you will never replace native Salesforce reports and dashboards with Einstein Analytics. However, Salesforce analytics is a tool – Einstein Analytics is a platform. There is a fundamental difference between the two, as you will see. Augmented analytics is the future of business insights. Using the power of machine learning and artificial intelligence, Einstein Analytics brings your data to life in a way that cannot be done manually. It delivers powerful predictive and prescriptive analytics and insights. Einstein Analytics (EA) provides a true 360-degree view of your customer that is fast and interactive. EA enables you to take immediate, contextual action on insights to create tasks, open your customer record, chatter to team members, and take action in Salesforce. This is huge! Einstein Analytics dashboards are embedded on your Customer record, right there in your business process, with any data from Salesforce and other systems. Collaboration – EA turns analytics from a pie chart into a conversation! (Thanks, Peter Lyons, for this slogan!). 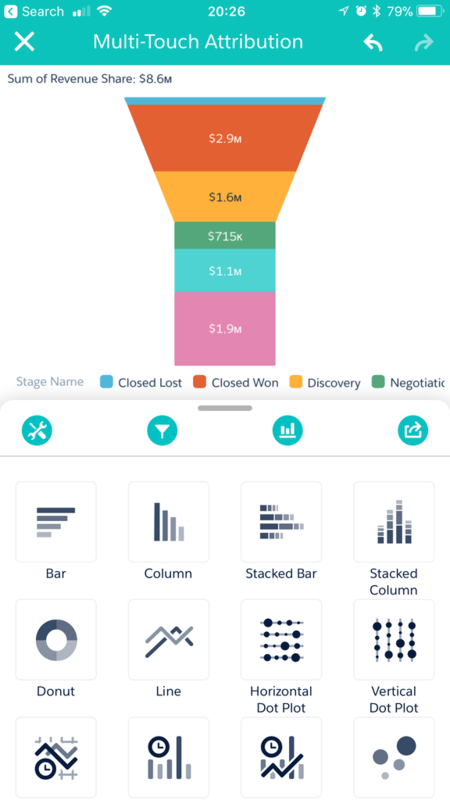 Charts can be annotated, shared and discussed in moments through a variety of means. It accelerates your adoption of Salesforce and amplifies your ROI to become a true customer-focused, data-driven organisation. EA gives Salesforce users the ability to analyse not just Salesforce data but external data as well, taking analytics from just looking at disconnected graphs to a far more meaningful analysis through fully interactive dashboards. 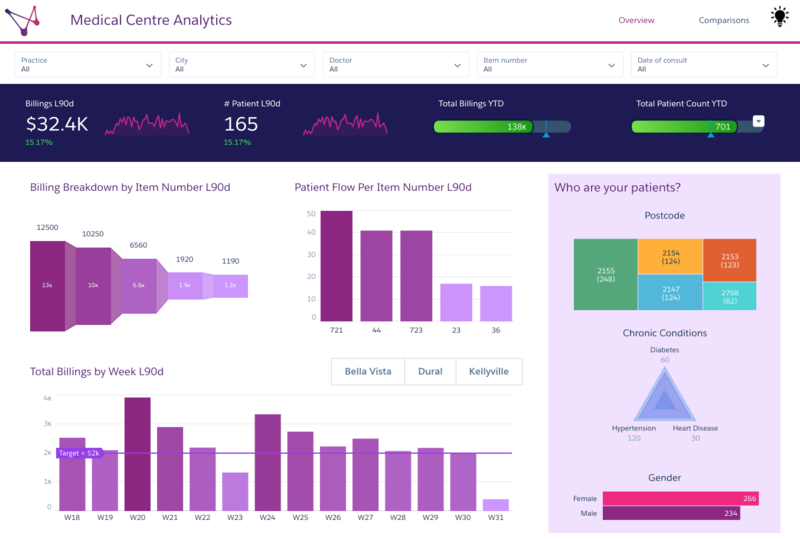 With Einstein Analytics, external data can be processed, manipulated, connected and visualised without storing it in your Salesforce org, saving valuable space, and helping to preserve your sanity. EA provides another level of customisability, empowering impressive and engaging visualisations, and enabling company or team branding. Then there is the beautiful and functional mobile app for EA! EA is more of a complete data enterprise solution that is beyond native Salesforce analytics. It is a true business insights platform. EA pages help create experiences that enable people to become productive by starting with data, and visualising what has changed, without moving the user away from an operational experience. Pages make the analytics experience layered without looking at three-page reports. Trending and waterfall charts! Look back over trends to get insights into how things are changing and why, and drill down as deep as you want, thus overcoming the limitations of the snapshot nature of native reports. EA offers powerful, advanced functions in compare tables that can help you rank, label and manipulate data without needing to create calculated fields, etc. Data recipes, where you can use the intuitive UI to profile and clean data for better use in analytics, harmonising data across sources, etc. You can combine and analyse objects and fields any way you want in the dataset builder. Say goodbye to just four layers of connectivity! I recommend that you reference Rikke’s blog for a detailed comparison of technical features and capability. In conclusion, compared to Salesforce reports, Einstein Analytics offers greater insight and contextual next steps all in one place. Fast. Thanks to many friends and colleagues for their input on this subject, including Rikke Hovgaard, Peter Lyons, Jennifer Shier, Brendan Verma, Carl Brundage, Ziad Fayad, Umair Rauf, and others. You guys rock! Next What is Einstein Discovery, and what can it do for your business?